We all know (unless you have been under a rock for the last few years) that patient management as it relates to motor vehicle collisions is changing in general. We are beginning to actually assess and treat victims according to their injuries, not by following a preconceived notion that everyone in a car accident will be paralyzed if we don’t grab their neck and strap them to a board. However, at the same time, there will be those patients that do require appropriate patient care and packaging, and I would suspect that this is another case where the medical care providers made a medically-based decision to do what they did to the vehicle. I say “another case” because back in 2013 another group of British rescuers were faced with almost the exact same scenario. At that time, my email blew up with messages and questions about why would they do such a thing? I addressed the incident and the exact questions in a 2013 article that I wrote for issue #65 of Technical Rescue Magazine. The article is entitled “You’re Damned if You Do”, and it seems like today you could extend that title by adding “And You’re Damned if You Don’t”. What would you do if faced with this exact or similar scenario? Would you base your extrication and patient care activities on the patient’s assessment, condition and medical needs? Science is leading us to a better understanding of trauma management, and in particular spinal care, and the management of these patients is evolving, just like all other facets of vehicle extrication. If you haven’t crawled out from under that rock yet, it is time to do so and learn what is changing. 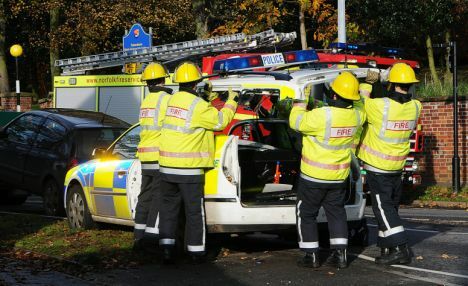 Ian Dunbar writes a regular blog on vehicle extrication for Holmatro. It is available by going to http://blog.holmatro.com/. I encourage you to read all of his articles! ← What is the best term to use?